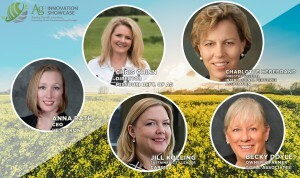 We on the organizing team for Ag Innovation Showcase were struck by Land O’Lakes’ re-imagining of the classic nursery rhyme about “Old MacDonald”, into the “She-I-O” version to honor female farmers for Women’s Equality Day, August 26. The right of women to vote became part of the US constitution on this day in 1920. We are reminded to salute women working across the entire food value chain from farm to table to feed the planet, including farmers, corporate leaders, and entrepreneurs. We are proud this year to welcome a slate of outstanding women leaders as speakers at the 2018 Ag Innovation Showcase. These leaders will share their perspectives regarding complex and pressing problems that industries face in providing nutritious food and meeting consumers’ changing demands as well as solutions to these problems. Jill Kolling, Global Sustainability Leader, Cargill. Cargill seeks to build a more transparent value chain where ingredients are traced from farmers through distribution and storage points to the consumer. Ms. Kolling’s presentation at the Ag Showcase is entitled: Transparency. Traceability. Transformation. Charlotte Hebebrand, Director General, International Fertilizer Association (IFA) IFA represents members from the global fertilizer industry (more than 525 members) on issues related to plant nutrients and public policies that impact member companies and collects and compiles industry information. Ms. Hebebrand will host a discussion between key industry leaders from Nutrien and Yara entitled: How to Most Effectively Implement the 4Rs of Precise Plant Nutrition. Chris Chinn, Director, Missouri Department of Agriculture and a fifth-generation Missouri farmer. Agriculture is the number one industry of the state of Missouri, and Ms. Chinn works to bridge the gap between farmers and consumers. Ms. Chinn’s presentation is entitled: The Impact of Innovation on Missouri’s Number One Industry: Agriculture. Rebecca Doyle, Co-Owner Hickory Grove Pork Farms. Ms. Doyle also a farmer has a public service record both as former Director, Illinois Department of Agriculture and as a former UN World Food Programme division director. She has worked to solve problems faced by farmers and those around the world in need of food. She will provide closing remarks entitled: From “Needy” to “Greedy”, “Now Feeding the Needy”. 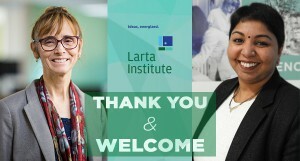 Anna Rath, CEO Vestaron, an Ag Innovation Showcase alumni presenter joined Vestaron in June 2018, bringing extensive agricultural startup leadership experience to Vestaron as it launches its first family of insecticidal peptide products. She has more than a decade of experience across multiple venture-backed ag-tech companies. Dr. Rath will join 5 other alumni on a panel to share Tales from the Trenches: Looking Back to Look Forward. In addition to the five speakers above, the Ag Showcase is proud to once again feature presentations from early-stage companies led by women entrepreneurs. For a description of the innovations that the above companies are commercializing, we invite readers to a previous Ag Showcase blog that describes the technologies that this year’s Showcase companies are commercializing. Larta announces a change in personnel with a new Agriculture Practice Director, thanking Claire Kinlaw and welcoming Bhandana Katoch.